This digital media revolution, inspired by frustration and opportunity, began with hope – as all revolutions do. Now, we are in chaos. We’ve seen this before – it’s the well-known narrative of upheaval. Hope and chaos go hand in hand. History shows us that revolutions begin with the emergence of a potential New Order, fueled by a mixture of disaffection with the Old Regime and the excitement of new possibilities. In France in the late 1700s, the monarchy was under fire for a breakdown in governance and poor finances. In the New World around the same time, the colonists had reached their limit on taxes and an absentee governing structure. In Russia in the 1910s, the tsar’s corruption and a dated industrial infrastructure compelled workers to follow a small group of ideologues into uprising. Today, in our modern world, the rise of the Internet threatens an Old Regime of industrialized media companies, built upon expensive, physical technology such as mechanical presses and broadcast satellites. As with the monarchy, the Old Regime once ruled with a firm hand as a small number of well-capitalized organizations. They never met all the specific needs of the information consumer, but it largely didn’t matter – mass demand matters more than individual preferences. But the rise of the Internet has facilitated a more networked information economy, where new players can communicate with one another and take action, thanks to increasingly inexpensive and powerful technology. This New Order promises a social production that doesn’t necessarily adhere to market-driven behavior. Suddenly, consumers have more choice. They have realized that they weren’t entirely happy with how the large media companies were operating, particularly as they amalgamated and engaged in monopoly behavior. Wikipedia has emerged to challenge Encyclopedia Britannica. Linux took on Windows. Blogs now challenge newspapers for readers. The digital media revolution began with a seemingly mild collection of networked, passionate amateurs seeking a more democratized, decentralized system of information. Behold the Digital New Order in recent years. Of course, the Old Regime will not go quietly. In the Second Act of revolutions, therefore, an epic struggle always ensues — with chaos the result. In France, the revolutionaries suddenly found themselves in charge, but they didn’t have a cohesive vision. The old system was on the ropes, yet the new system wasn’t developed enough to stave off the chaos. Radicals sought to upend the revolution, through a campaign of violence to suppress internal dissension quickly and brutally. During this time, Robespierre led France’s blood Reign of Terror. It’s from this period that we get the ominous phrase “revolutions, like Saturn, devour their children.” That’s exactly what happened in the Soviet Union with Stalin’s bloody purges, as he assumed absolute power by eliminating his fellow revolutionaries. Chaos is similarly the defining characteristic of the current moment in our digital revolution. We face so many new digital platforms that, while excited, we are bewildered about how best to be information consumers. Though we may dabble with them, they seem too transitory, untrustworthy and demand too much decision-making to provide an adequate substitute for old, passive media regimes. However, at the same time, in a desperate bid to regain control, the Old Regime tries to fend off the revolution through free online content distribution; this only exacerbates the chaos as consumers question why they need to pay for content at all. The Old Regime’s revenues plummet. Some fail, others lose their primacy, professional expertise is called into question. Just as the French Revolution produced the “Cult of Reason” during this phase, some observers begin to decry the “Cult of the Amateur” – with a reign of mediocre content that has no foreseeable monetization strategy. New platforms, such as Friendster and MySpace rise and fall. YouTube becomes a dominant force, but advertisers don’t come near the edgy, shaky user-generated video. They yearn for something more professional, with a guaranteed return on investment. We, the people can only live with chaos for so long. One way or another, order must be established. One pathway forward is to fulfill the initial, idealistic promise of the revolution and enter the Promised Land. In America, a small group of young visionaries authored a Declaration of Independence — a powerful narrative combined with English intransigence — which fueled a revolution-in-progress waged by an inspired citizen army. Later, they drew up a Constitution that extols freedom and equality for all. It would take decades for the ideals of this document to be fulfilled – with the abolition of slavery, universal suffrage and desegregation – but the values were seeded. There was no going back. A second pathway is to restore the Old Order. In France, weary of conflict and bloodshed, the people demanded stabilization and a return to institutional comforts. Provided an opening, a strong leadership restored social equilibrium, eliminated the most violent of the radicals, and brought the revolution to an end. Napoleon became Emperor, securing the borders of a newly centralized state — as well as a constant state of war, and ultimately bankruptcy to the nation; he died in captivity. Here, in the digital revolution, we stand at a crossroads. Some might suggest that the stakes are not as high for all of us as in these earlier revolutions. I disagree. Who we are as Americans, as global citizens, as humans, is on the table. We are defining ourselves for decades, perhaps centuries to come. In this moment, to one side stands strong New Order actors such as Facebook, Google and Apple — which support the digital revolution’s objectives of openness, freedom and transparency while at the same time capitalizing upon the citizenry’s craving for order. In these organizations, both sides of the coin — democratic revolution or the capitalistic profit maxim — are in tension. As a result, they begin to build walls around their communities and content, narrowing the choice of platforms, centralizing the user experience, even as they battle among themselves for primacy and control. Still, they remain the best and brightest hope for the revolution to succeed. Meanwhile, the television networks, newspapers, publishers, and production companies that define the Old Regime are bloodied, yet survive. They’re eager to connect with the winners who now begin to dominate. They hope that they can begin to collaborate with these new powerful players, to re-establish the dominance hierarchy (favoring them) that the revolutionaries had toppled. Hollywood strikes deals with Google, which buys YouTube. Advertisers are beginning to be appeased. Through the re-entrenchment of a closed information economy, monetization can once again occur as the citizenry has been herded back across the moat into media fortresses. The Old Order’s mantra is “Meet the new boss, same as the old boss,” borrowed from Pete Townsend and The Who — who joined the Old Order by performing at the 2010 Super Bowl. But we don’t have to go down either road. There’s still another path that we can choose, one that fulfills the initial promise of independence from overbearing, monopolistic institutions. We, the “people formerly known as the audience” have had a taste of freedom and choice thanks to digital technology. Although we may want some of our new media to still be ordered and manageable, we cannot tolerate a return to the passive, controlled transmission of information. Indeed in March 2010, the Pew Research Center declared that when it comes to news consumption in America, the “public is clearly part of the news process now” with half of their news coming from other people around them telling them what they should know – people, not institutions. And thankfully, all is not lost. The openness of the World Wide Web may be vulnerable to powerful new players who persuade of us of the value of order through closed regimes and a return to a top-down command information economy. But that openness, thanks to the highly decentralized, global infrastructure of the Internet (upon which, the Web is merely an application), may never be entirely controlled, unlike the limited points of intake in mass media. Therein lies our opportunity. So how do we rediscover our revolutionary voice? The answer lies in our human need for stories. Long before humans had formal language, they had stories. These were pictures on walls, or in the sand. They were rituals. Over time these developed into formal languages, fully developed alphabets, and then into modes of public discussion. At the heart, always, is the ability to tell stories. A well-conceived story provides a narrative that, according to researchers in psychology and literary studies, “transports” readers and hearers into a new way of thinking. Stories foster learning in creative ways. Memory is facilitated. Emotional depth is gained. And most importantly, stories provide connective tissue that we can control and extend to others, forming a trusted connection of accountability between storyteller and community. If we now find ourselves in an “attention economy” — where attention, and not information is the scarce commodity — then we can convince people to pay attention by telling stories, and building community around those stories. In the past century, however, we abdicated the power of storytelling to media companies and their inaccessible, industrialized technology. Now, thanks to digital media we can reconnect through story, and we don’t need an institutional intermediary to do so, try as they might to control the flow of information – either through locked-down platforms or regulation – as they attempt to convince us that only this constrained environment can ensure trust and order. Through the Web as communication medium, we need to continually exercise our power to connect to each other. We need to tell stories. This book is how we do this. This book is how we must do this. We only need to look to one of the most tightly controlled communication lock-downs in the world – Iran. 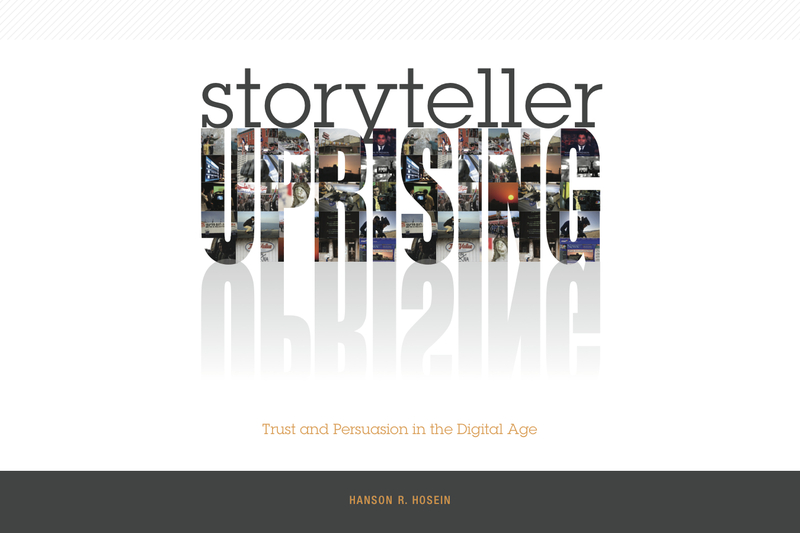 There, in 2009, people were still able to create strong enough relationships of trust with each other to share, collaborate, and take collective action through a popular uprising enabled by mobile phones, social networks and online video. It was an ordered form of communication, but not a hierarchal one, which facilitated powerful interpersonal transactions. The dictatorship in Iran may have later blocked access to communication technology long enough to squelch the uprising (and concurrently constrict commerce facilitated by digital technology). But Iran is now a regime living in fear of its own citizenry, who have suddenly had the opportunity to connect, and realize they are not alone in their discontent. So, in this digital media revolution, there is room for another — more organic ordering — that can save us from the atomistic chaos that we so fear. The pathway forward is to create a storytelling ecosystem, which facilitates continual credible communication between teller and listener — through memorable, emotional narrative, enabled by the connective power of relationship. As Mahatma Gandhi said about dictatorship: “There have been tyrants…and for a time they can seem invincible, but in the end they always fall.” They fall, because injustice inspires the narrative conflict for us to take action and restore equilibrium. That narrative once came from powerful leaders or powerful books (Abraham Lincoln reportedly said of the author of Uncle Tom’s Cabin, “so that’s the little lady who wrote the great book that started this great war”). Now, powerful ideas can readily emanate from highly accessible conduits of communication such as a dramatic story filmed on a cellphone camera, spreading quickly and authoritatively among us all, by us all. Today, we have chaos. Tomorrow, we will have either built the modern-day equivalent of Napoleon, or we will have brought our very own Declaration of Independence to life. The citizens of Iran have shown us the way. It’s time for a Storyteller Uprising.